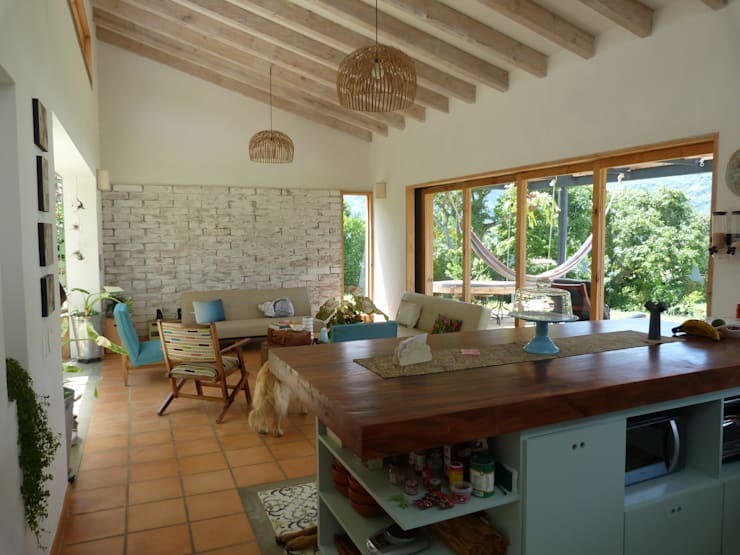 This gentle, tropical Colombian cottage has a pretty, cosy ambience. It's located in a quiet rural area, possesses generous views of the surrounding countryside and enjoys a lush, tropical atmosphere. The architects Interior137 have made the most of the balmy climate and created a home with equal emphasis on indoor and outdoor life. The result has not just been realised by the liberal use of glass windows and fancy views. This is a home that really encourages the occupants to pass from interior to exterior spaces throughout their daily life. The main building is just a couple of small homes. 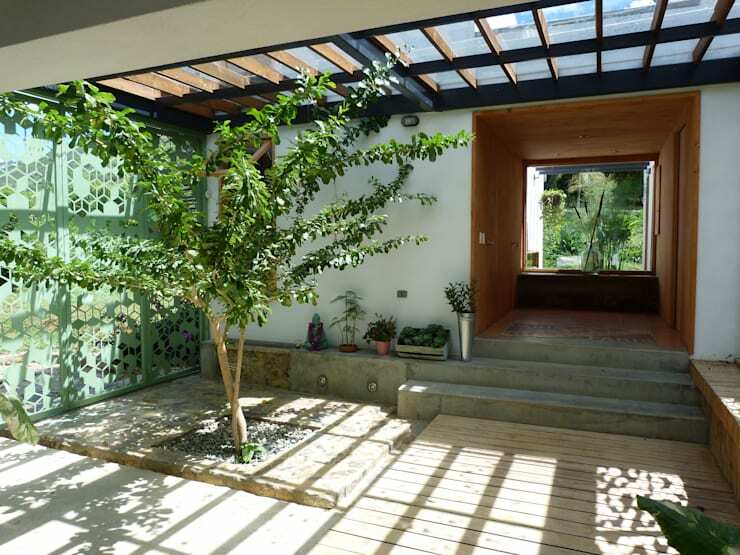 But it's the walkways and courtyards that define the home. The occupants need to pass through these areas to pass from the bedroom to the main living areas. These passageways and interiors possess a bright and homely ambience. This is largely due to the humble proportions, brick feature walls and colourful decorative features. But we won't give away too much here. Come with us on a photo tour to learn more. The bright country style living room has rustic exposed timber beams, a pitched roof, and large sliding glass doors. The rustic, cosy decor has been created with an abundance of raw materials. A roughly painted brick wall, wooden window frames, a timber bench and earthen tiles are all present. From this angle we have the outdoor deck to the right and the kitchen just behind us. We will turn back to the kitchen for a moment before moving forward through the home. 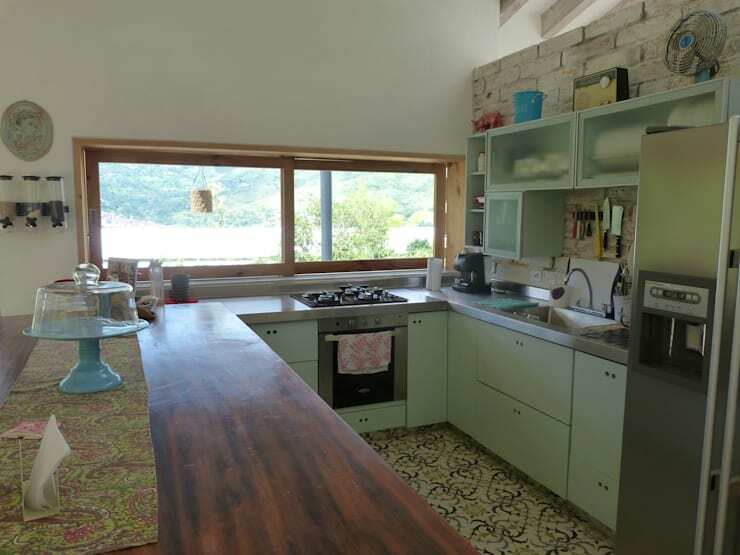 Here we have decorative floor tiles, timber countertop and pale, pastel green kitchen cupboards. The proportions of the kitchen window are humble and the entire space has an almost retro feel. The variety of colours and texture give the kitchen a cosiness to suit the living area. This is not a kitchen to impress, but rather a rustic kitchen where a person can feel at home. Returning to the living room, we move slightly forward to explore the integration of interior and exterior spaces. A big, broad opening in the living room wall leads to the main passageway in the background. This part of Colombia has a balmy and often stifling climate, so it's important to have the maximum flow of light and air. Note how the upper window panel has been installed for this reason. Moving through the passageway, we come across the interior courtyard. A small tree provides focus. 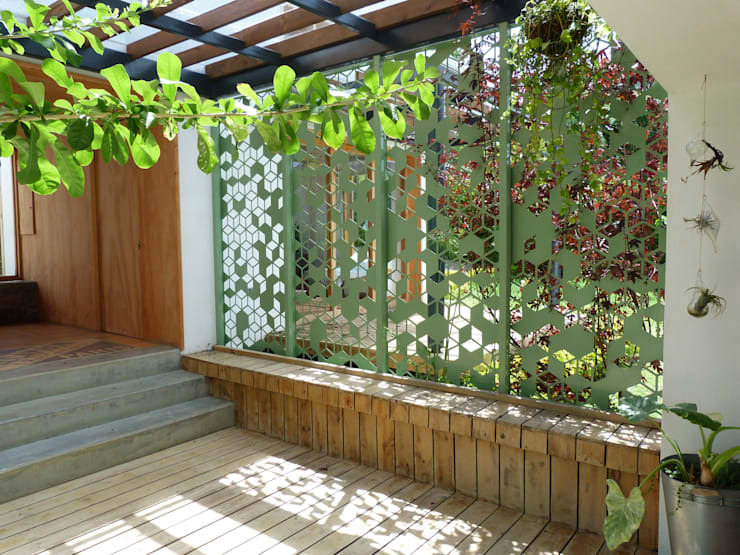 The rooftop is covered in glass panels that allow for lots of light and the walls are made from green, decorative iron panels. It's the blurred boundaries between indoor and outdoor life that really strike us about this home. Ahead we have the stairs leading to a cubic area made from plywood. This is the sleeping area. Let's have a closer look at those decorative iron dividing walls. They are composed of a kaleidoscope of opaque and negative spaces that resemble the leaves of a plant. The shapes create a pretty geometric pattern of shadows on the walkway. It's a lovely choice that adds a very green, unobtrusive look to the passageway. We imagine that in time, the climbers will wind their way through the panels as well! We will move back a moment to give a little perspective on the layout. Here we have a sense of the two small building masses and the connecting areas. The basic design of each cottage is commonly seen in the Spanish countryside. But while the original designs of these homes were often dark, this modern take on the rural home is one that embraces outdoor life. Inside the bedroom, we have a humble, but enlightening view of the layout. 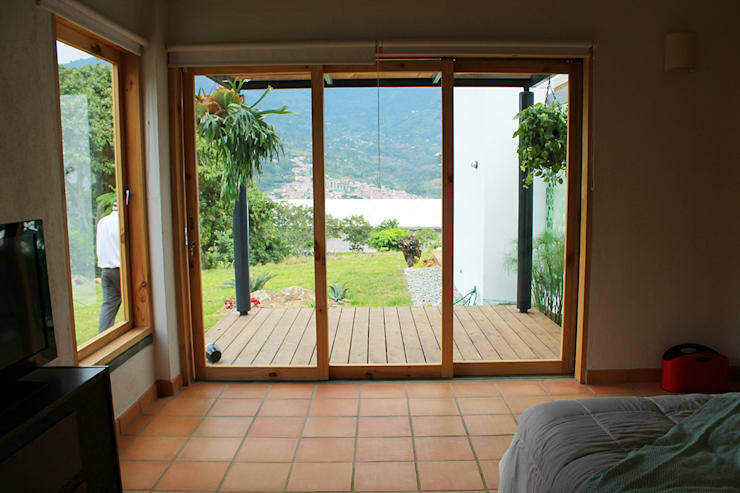 The floor to ceiling sliding glass doors lead to a timber deck where the occupants enjoy fine views. 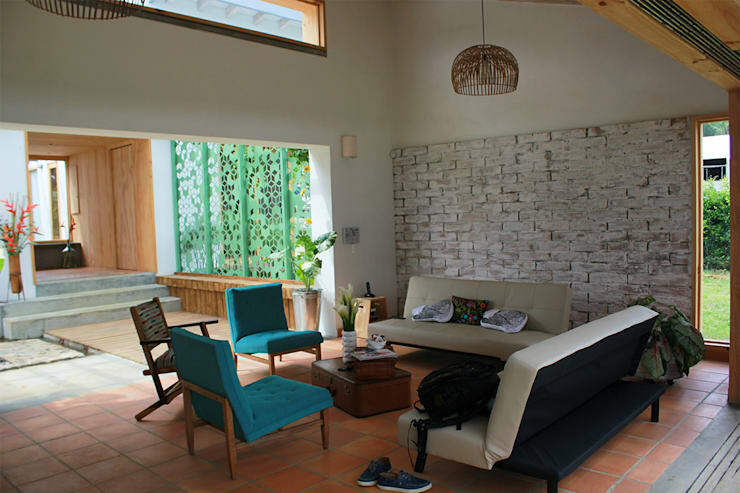 The white walls and earthen tiles complete the earthy ambience. If you like rustic homes, you'll love this Ideabook Horse stables to luxurious holiday home. 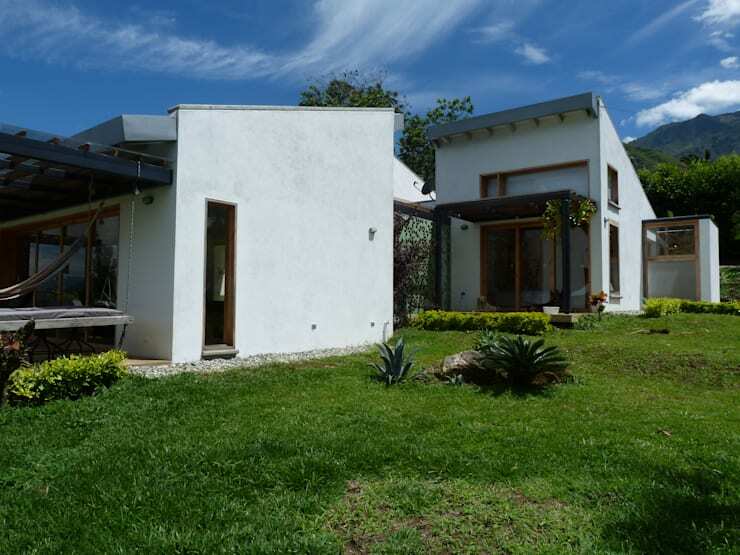 What do you think of this open air home design? We would love to hear from you in the comments field below.